The Morso Badger is a multi fuel stove with one door. 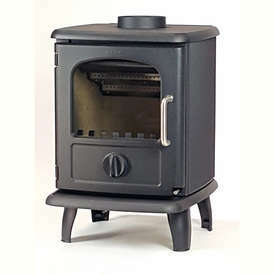 Stove expert replied: Good solid stove providing great service over many years. Great stove, have had no problems. Not sure how to use as multi fuel as only using for wood at present. It is really lovely would buy again. Stove expert replied: Great review. Stove expert replied: Disappointing problem with the grate and ash removal system. Stove expert replied: Take care not to stack your wood too close to the stove, it is combustible!!! Stove expert replied: Another great review for a Morso stove, amazing heat produced for such a small model. The Morso Dove stove is still in production and is a cast iron stove with a very traditional design.